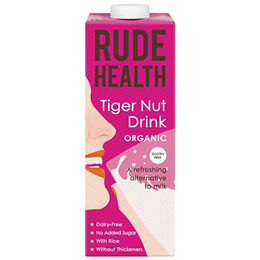 Spoiler alert: tiger nuts aren`t nuts, and have nothing to do with tigers. But they are stripy in a tiger-print kind of way, and they grow underground, which makes them the most glamorous tuber in our book. A refreshing alternative to milk. Use with cereals, add to coffee or hot chocolate, add to a smoothie or shake, or even bake with it. Below are reviews of Rude Health Organic Tiger Nut Drink - 1 Litre by bodykind customers. If you have tried this product we'd love to hear what you think so please leave a review. Gorgeous stuff for a person who thought they’d never get off cow’s milk!